Lovely ornate sewing machines with floral designs on a white background, 100% cotton from the Dashwood Studios Stitch cotton collection. 110cm / 44" Width, this fabric weighs approximately 150gsm. Multiples of a size will be cut as one piece unless requested otherwise. 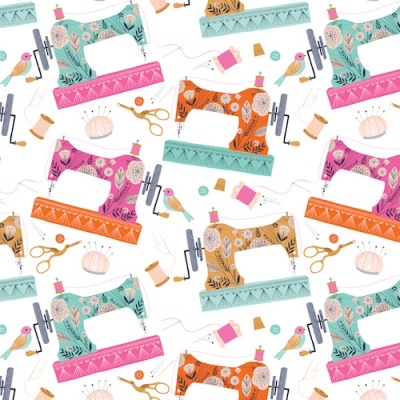 I received stitch sewing machines fabric, I was certainly very pleased with the bright colours & quality ,I will definitely buy again from rooftop ,Now what shall I make ! !